The Acoustical Society of America is encouraging people to observe International Noise Awareness Day on April 25 by using the SoundPrint app for smart phones to record and post restaurant noise levels. DISCLOSURE: I am the Medical Advisor for SoundPrint. April 26 marks the 22nd annual celebration of “International Noise Awareness Day,” an event born in the U.S. that has grown into an international occasion. Congratulations to the event’s founder, Nancy Nadler, for her pioneering work and to other Americans who have long contributed to and supported it, including The Quiet Coalition (TQC) founding member, Arline Bronzaft PhD. In the U.S., International Noise Awareness Day precedes the month long celebration of May as “Better Hearing and Speech Month,” led by the National Institute of Deafness and Communication Disorders, the American Speech Language Hearing Association, and other scientific, professional, and governmental organizations. The European Acoustics Association (EAA) participates in the celebration every year by a series of events addressed to the whole society, with special emphasis to young people who are among the most sensitive persons of our society. These events have been organized so far typically by the EAA Member Societies. For 2017, the EAA decided to coordinate a wider campaign in order to raise the interest of the European citizens towards noise and its effects on the quality of life and health (the INAD 2017). EAA will collaborate with the European Commission (in particular the DG-Environment) and the European Environment Agency for promoting and coordinating specialized activities during this year, among the EAA members Societies, and the European and national authorities, the noise associations, the schools, museums, etc. in order that a wider public will receive the most accurate and scientifically correct information on noise effects. Three TQC founding members plan to observe the 22nd Annual International Noise Awareness Day by holding an informal educational event at the Flatbush Library in Brooklyn. 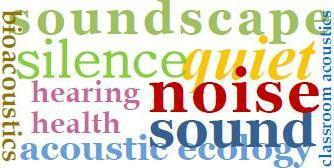 Arline Bronzaft, Gina Briggs, and Jeanine Botta will introduce some of the Brooklyn Public Library’s adult and children’s books related to noise, sound, acoustics, and hearing health. Attendees will learn about an abbreviated timeline of the history of noise, become familiar with New York City’s noise code, and have a chance to learn about potential resources for addressing their own noise concerns. The event will be held from 3:00 to 5:00 p.m. on April 26th, and is open to the public. The Flatbush Library is located at 22 Linden Boulevard, a few blocks from the Church Avenue train station on the B and Q lines and a few blocks Church Avenue station on the 2 and 5 lines. For more information, call the library at (718) 856-0813. So what can you do to mark International Noise Awareness Day 2017 and Better Hearing and Speech Month? Check out some of the participants, public events, and resources. Originally posted on The Quiet Coalition blog.